Brightly-coloured clothing, a wide range of participants and clear progression were all in evidence as Sri Lanka staged its latest Global Laser Run City Tour in Bandaragama on August 19. This was Sri Lanka’s first City Tour held outside of the capital Colombo, and the aim was to enable members of the public from rural communities to have the same opportunity to participate in UIPM Sports as their urban neighbours. 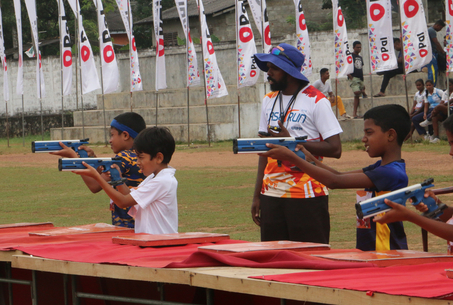 Almost 200 athletes flocked to the Bandaragama Public Ground and there was a mixture of participants who had already competed in Laser Run in Colombo and others from nearby communities who had attended training camps run by the Modern Pentathlon Federation of Sri Lanks (MPFSL) in the preceding two months. There was an elite race as well as Under 19, Under 15, Under 13 and Under 11 categories. The Sri Lankan Forces were represented alongside Modern Pentathlon clubs, as well as a number of universities. A spokesperson for the local organising committee said: “The idea was to help the school kids and youth in the region to gain experience by using their training in a competition environment. “Some participants were representing Sri Lankan Universities and it was heartening to see that there were commendable performances from them too. Their participation made the event more colourful and generated much interest among the viewing public. “We were able to see that the introduction of new coaches, with the help of UIPM and the Ministry of Sports, has paid dividends almost immediately with the performance levels of athletes increasing compared to the previous editions of the event. The event also included a segment by clothing industry experts and universities, who provided participants with knowledge about sportswear through a “Know How Expert” programme.